Have you been looking for a dash solution for your vehicle, but just cannot find anything you like or that is cost effective? No need to look any further as Holley has created a full color touch screen dash that includes sensors for monitoring basic engine parameters as well as a GPS speedometer all in a cost effective package! 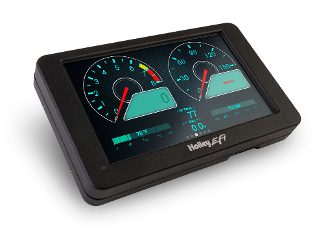 Holley’s stand-alone digital dash has great features such as; a weather resistant aluminum housing for durability, multiple gauge and indicator type selections, customizable screen and gauge layouts and a virtual switch panel just to name a few. With the integrated 3 axis accelerometer and data-logging, the dash is ideal for anything from a JR dragster to Sportsman racing. It is also equally at home in a daily driver, or a show winning roadster. Completely customizable layouts, with multiple default configurations to get you running in no time! A variety of additional sensors are available for use with the dash, including fuel pressure, nitrous pressure, boost, with more to come! Pair with a Holley EFI LED Light Bar (PN 553-107) for a truly customizable solution!